by Eat. Live. Travel. Write. 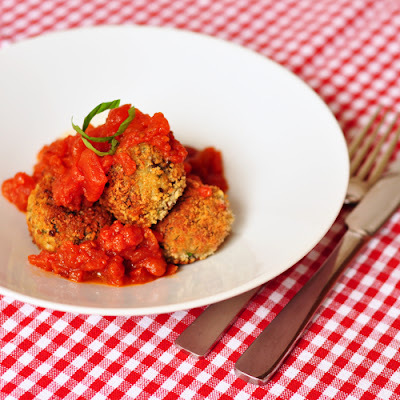 I first tasted a version of these wonderful “egg balls” at Massimo Bruno’s Italian supper club in Toronto and managed to sweet talk the recipe out of him! Since then, it’s been a sure-fire crowd pleaser as an appetizer at dinner parties but the addition of mushrooms brings the taste to the next level and the dish into the realm of a main course. Makes 10. With less than 30 minutes prep and about 15 minutes cooking time, this is a wonderful go-to weeknight meal and something a little different to serve too. Nutritious, easy, tasty and pretty – what could be better? 1. Beat the eggs and the baking soda with a whisk. 2. Slowly add the cheese, the breadcrumbs, the parsley and mushrooms to the egg mix. Season with sea salt and pepper and fold gently until all ingredients are combined. 3. Using a teaspoon form small balls of the mixture, then roll them in the extra Panko crumbs. 4. Heat the oil in a frying pan, add the egg balls 2-3 at a time and fry over medium heat until golden brown all round. You will need to turn them to make sure they brown evenly. 5. Drain on a paper towel and continue until all balls are fried up. 6. Heat your pasta sauce over medium heat and then add the balls when the sauce is bubbling. Turn the heat down to low and partially cover the saucepan. Continue to heat for about 7 minutes – the balls will be warm through and will have absorbed some of the sauce. 7. Serve topped with fresh basil. Mardi Michels, is a well known food blogger who resides in Toronto, Ontario. In “real life,” Mardi is a full time elementary school French teacher. She also moonlights as a part-time PhD student, and is halfway through the Food & Media certificate at George Brown College, in Toronto. You can find her travels and recipes documented on her blog. For more Mushrooms Go PINK recipes visit www.mushroomsgopink.ca.